Foregenix – the cyber security company whose people and products safeguard websites from being hacked, breached or compromised – has been named as one of the UK’s fastest growing SME exporters. The company has been listed in the Sunday Times’ SME Export Track 100, after increasing its exports by 53% over the past two years. Foregenix achieved overseas sales of £3.5m in 2016, equivalent to 67% of its total sales. According to the Sunday Times, the success reflects the growing worldwide threat of cyber-attacks, coupled with increasingly stringent customer data protection regulations. It says the Foregenix ‘team of globetrotting cyber-crime consultants, and its risk-reducing solutions including malware scanners, website security and payment protection software is popular with multinational clients from as far afield as Copenhagen to Cape Town to Atlanta’. Founded in 2009, Foregenix works with clients in the payments industry, retail and e-commerce, financial services, public sector and governments. Its digital forensics team is recognised as one of the global leaders in the industry, and based on their experience, it has developed a range of solutions for SMEs, to identify vulnerabilities and malware on websites and provide mitigation and protection. Foregenix is based in Marlborough, UK with offices in the USA, Uruguay and South Africa with a new office opening in Mainz, Germany this year. The company was the only cyber security business to feature in the SME Export Track 100 and was ranked at number 59. 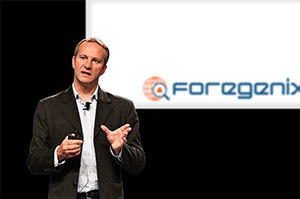 Andrew Henwood, CEO of Foregenix says there has been growing demand for solutions such as FGX-Web and Serengeti in view of the increase in attacks on websites, especially ecommerce sites. Sales growth has been particularly strong in North America and was likely to continue in the year ahead, while it expected new data privacy rules such as the EU’s General Data Protection Regulation (GDPR) would help to accelerate sales in Europe. Foregenix is an independent, specialist information security business, headquartered in the United Kingdom, and with offices in the USA, Germany, South Africa and Uruguay, it has a global service capability. The Foregenix team has operated in the payment card industry since the inception of the security standards in 2004, and has carried out forensic investigations and compliance assessments on hundreds of organizations, ranging from small online stores to national banks. Foregenix has certified over 40% of the P2PE solutions and 70% of the P2PE applications globally.